Equatorial regions are located in a band around the Equator and cover about 6% of the Earth's surface. They are often in lowland areas and have a climate that is hot and wet all year round. 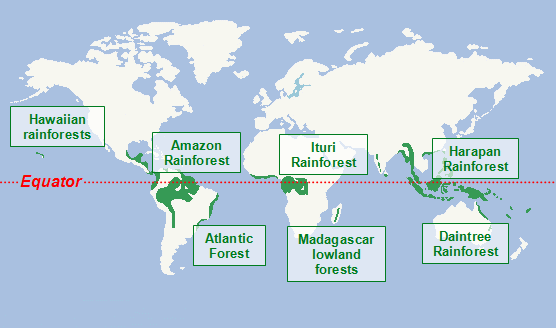 Tropical rainforests grow in the equatorial regions. The Amazon Rainforest covers an area of 5,500,000km2 in: Brazil, Peru, Columbia, Venezuela, Equador, Bolivia, Guyana, Suriname and French Guiana. The Atlantic Forest covers an area of 1,315,460km2 in: Brazil, Paraguay and Argentina. The Madagascar lowland forests cover an area of 112,600km2 on the island of Madagascar. The Ituri Rainforest covers an area of 63,000km2 in the Democratic Republic of Congo. The Hawaiian tropical rainforests cover an area of 6,700km2 in the Hawaiian Islands. The Daintree Rainforest covers an area of 2,600km2 in Australia. The Harpan Rainforest covers an area of 985km2 in Sumatra. Some of the longest rivers in the world flow through tropical rainforests like the: Amazon, Mekong, Orinoco and Congo because they receive so much rainfall.